Remember those liquid metal Terminators from the Arnold Schwarzenegger movies? What if I told you that kind of material isn’t just the fruit of someone’s sci-fi imagination, but a real metal? It’s called Gallium and it has some pretty cool properties. 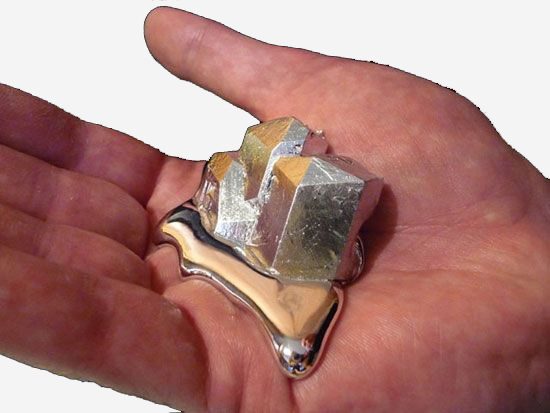 So what makes gallium so special? Well, first of all, the brittle metal has a melting point of just 29.76 °C (85.57 °F), so if you hold it in your hand long enough it will become liquid. That alone is pretty cool, but this rare metal has a few other amazing properties. For example, it “attacks” other metals, like aluminum. As you’re about to see in one of the videos below, just a drop of liquid gallium weakens the structure of a Coke can to the point where it can be pierced with the slight press of the thumb. Gallium infiltrates the aluminum structure, compromising its integrity and making the can feel like tin foil instead of metal. Another interesting experiment involving gallium is called the “beating heart”, in which the amazing element is made to look like an alien life form. When submerged in sulfuric acid and a dichromate solution, gallium looks like an organic beating heart, due to the gallium sulfate which increases surface tension.